Ten Best Pocket Projectors 2019 – Project Photos, Graphics and Presentations Anywhere! Not too long ago, the smallest projector that you could purchase was almost the size of a couch. 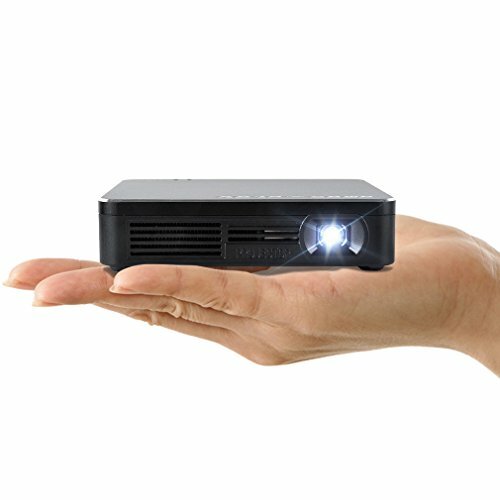 With advancements in technology, the size of modern projectors has been reduced, and today, you have the option to purchase projectors that can fit in the palm of your hand. These products are small, lightweight and powerful, and depending on the product, the picture quality might be comparable to what you’d get from a larger unit. They’re called palm-top, Pico and pocket projectors, and they’re very easy to transport between locations. 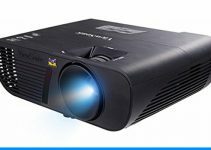 You can toss one of these projectors into a briefcase, and with such a small size, they’re much more convenient, but unfortunately, these tiny products can force you to compromise on picture quality. If you want to find the best pocket projector for your needs, there are some things to consider. When shopping for these products, you need to consider how portable you need the device to be. Most pocket projectors fall into two main categories, which are Pico and palm-top. Unfortunately, due to the way that manufacturers label their products, you might have some trouble identifying the correct category for the product you’re interested in. Almost every manufacturer refers to palm-tops as pocket projectors. The reality is that most palm-top devices are about five by five inches and wouldn’t fit very well into a standard pocket. Pico projectors are the smallest that you can get, and they have a size that is comparable to a modern smartphone. Palm-top projectors are small enough to be carried around in a briefcase, but they won’t fit into your shirt pocket very well. A Pico projector is small enough to be taken anywhere. To reduce size, many manufacturers have designed their projectors to read information from a USB stick. If you can take advantage of this feature, then you should be able to leave your computer at home. When you’re dealing with pocket projectors, resolution is important. If the resolution is terrible, then it can ruin the whole experience. Whether you’re handling a business presentation or plan to watch movies, resolution is an important feature, and it shouldn’t be ignored. 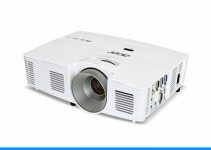 For the best results, you want to choose a projector that matches the native resolution that you’re used to. The problem is that most pocket projectors don’t afford you this luxury. Almost all palm-top projectors are universally SVGA, which means you might not be able to get an 800 by 600 resolution. You’ll find that most palm-tops offer a resolution that is closer to 858 by 600. In other words, the projector is forced to increase the size of a VGA image, which reduces the overall quality of the picture. When it comes to choosing a resolution, Pico projectors offer a bit more variety. However, you’ll find that most Pico projectors max out at around 640 by 480. This isn’t a bad resolution for basic presentations or video, but the details won’t be very fine. You won’t be able to get native widescreen resolutions from any pocket projector, so it’s important to make sure that it can accept the signal you’re planning to feed it. Contrary to popular belief, brighter isn’t always the better option for standard projectors, but since most pocket models offer very little brightness to begin with, you don’t have to worry about purchasing a product that is too bright. 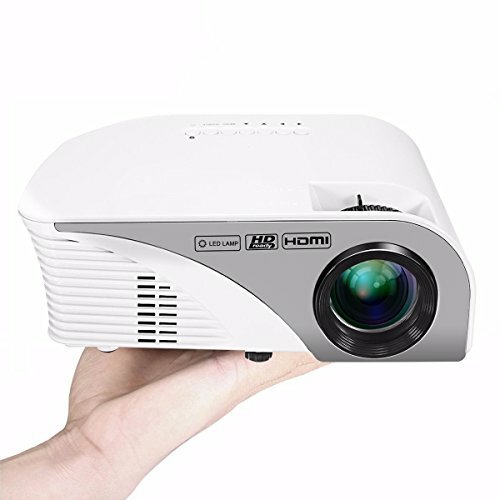 Since they produce very little light, brighter is better when shopping for palm-top projectors. You’ll find that many of these smaller products start with a brightness of about 10 lumens. With this amount of light, you shouldn’t have any trouble projecting a basic image in a dark room. Many of the newest palm-tops have a brightness rating that is nowhere near 100. However, there are some devices that product close to 200 lumens. Another feature to consider is the contrast ratio, but you shouldn’t worry too much about it. The tiny size of pocket projectors makes the contrast ratio almost irrelevant. Before you decide on a product, you should consider the connection options. Almost all Pico and palm-top projectors use an SVGA connector, which is great for connecting to a computer. There are some models that can only be connected to a composite connector. It’s important to think about what you’ll be connecting your projector to and make sure to match the connector type. A final consideration to make is the audio. When it comes to pocket projectors, some have great audio capabilities, and other models give you almost no options. If you plan to use the projector for applications that require a decent amount of sound, you need to make sure the sound is loud enough. For the best results, consider a product that lets you send audio to a stereo system. The first product on the list is from ASUS, and it’s powered by a built-in 6,000 mAh rechargeable battery. It can provide three hours of projection time and doubles as a power bank for mobile devices. It features advanced DLP technology, and the LED bulb has a lifespan of 30,000 hours. With a brightness of 200 lumens, this projector offers one of the brightest pictures available from these tiny devices. It has a 854 by 480 native resolution, and it can project a picture up to the size of 100 inches. This product is lightweight and can fit in your palm. The ASUS S1 is extremely portable, and you can even connect it to your iPhone or iPad. Here is one of the tiniest projectors on the market. It can project a 120-inch display, and with a size of only two inches, you can hold it in the palm of your hand. It can be used with HDMI devices and has a rechargeable battery, which delivers 90 minutes of usage. 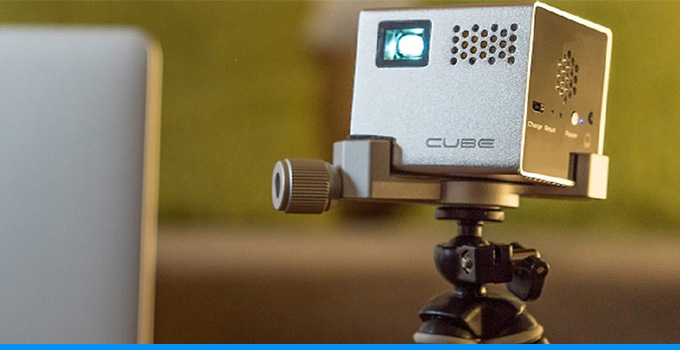 For easy streaming while on the go, this pocket projector can be connected to mobile adapters. It has a built-in LED bulb, which has a lifespan of 20,000 hours. It’s made with weightless aluminum and delivers a vivid, 120-inch display. Superior portability is what sets this product apart. The ELEGIANT portable LED projector isn’t the smallest pocket projector available, but it offers significantly more lumens than many competing products. With a brightness of 1,200 lumens, this product delivers a powerful, bright display. It has technology that keeps the projected image in focus and optimizes color fidelity. It has built-in stereo sound, which is great for a cinematic experience. The high-quality optical lens provides better temperature resistance, transmittance and color reproduction. This ELEGIANT projector can even be connected with several different interfaces. Since it has HDMI, USB, SD, VGA and AV slots, you can connect it to almost any device imaginable. This product has a built-in Android 4.4 system, Wi-Fi, dual frequency and Bluetooth. It can be wirelessly connected to speakers, game controllers and Android devices. It uses an industry-leading four-core CPU chip. To give you a smoother picture, it also has eight gigabytes of memory. If you want a pocket projector for 1080P movies, this product is worth considering. For a high resolution and clarity, it uses DLP technology, and it supports a native resolution of 1,920 by 1,080. The BIIPro BP-H3000A can project an image between 60 and 150 inches. Since it supports HDMI output, you can connect it with many different devices. 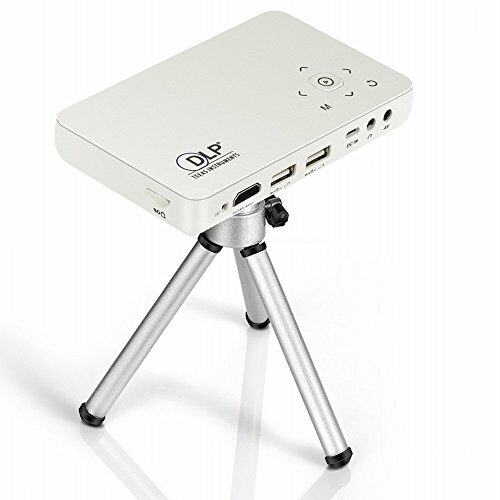 The Amaz-Play mobile Pico projector is lightweight, compact and portable. It draws power from a 4,000 mAh rechargeable battery, and on a full charge, it can give you 120 minutes of play. The Amaz-Play also doubles as a power bank, and you can connect it to your tablet or smartphone. Unlike many other pocket projectors, this unit offers superior wireless capabilities. It can serve as a wireless hot spot and connect with third-party programming. It’s compatible with a wide range of devices, and you can use it with your smartphone, laptop or tablet. It uses the latest DLP technology and delivers a brightness of 100 lumens. 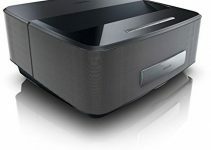 The Amaz-Play mobile projector can create a screen size of 120 inches. 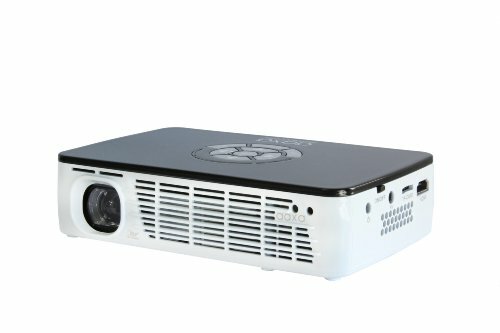 Another top pocket projector is the AAXA P300. This tiny device weighs less than a pound, and it will easily fit into any laptop case. The onboard battery can give you 60 minutes of play time, which is great for a short presentation. The AAXA P300 has built-in speakers, and it’s ideal for personal media sharing and business presentations. Since it has VGA, HDMI and AV connectors, you can connect it with a variety of devices. With a brightness of 300 lumens, this product delivers enough light for decent picture quality. It supports 1080p, 1080i and 720p resolutions, and when used in low-light conditions, it can produce an image up to 120 inches. Here we have another tiny projector, and it’s small enough to be taken almost anywhere. It can be used to project data, images, video and movies from a variety of devices. You can connect it to your laptop or gaming system, and for maximum compatibility, it comes with an HDMI cable. It also supports DC, TF and USB. You can connect it to your Android or Apple phone, and it features a built-in 4,400 mAh battery, which can deliver 3.5 hours of play time. With a brightness of 80 lumens, this projector is ideal for low-light conditions. Here we have another top product from ELEGIANT. It has a small, portable design and weighs less than two pounds. It’s great for traveling and works well for watching movies outside. For a small projector, the 1,200 lumens of brightness is a huge advantage. It has a bright LED bulb, which has a lifespan of 20,000 hours. It has multiple input ports, which includes VGA, video, HDMI, AV and USB. You even get a remote controller. This ELEGIANT smart Wi-Fi projector delivers a native resolution of 800 by 400 and maxes out at 1,920 by 1,080. If you’re looking for a basic office projector, this product is worth considering. Since it doesn’t use a direct LED light source, it helps to protect your children’s eyes. It has a small, compact size and can be connected to other devices. It can serve as a decent home entertainment system or office projector. The brightness of the picture is 1,200 lumens, which is the perfect amount of light for low-light conditions. With inputs for AV, HDMI, VGA, SD and USB, the connection options are endless. This is a great product from Uniway. It offers the latest DLP technology and uses an RGB LED light source. It has support for 1080P HD video decoding and stereo sound. With a built-in 2500 mA rechargeable battery, it offers 120 minutes of play time on a full charge. 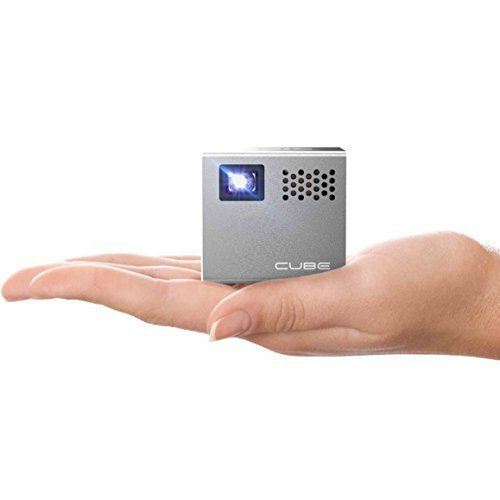 You can connect this tiny projector to your smartphone or iPad, and it will accept input from a variety of other sources. It has a powerful LED bulb, so it can produce a great picture with 500 lumens of brightness.